Eliza prides itself in serving fresh Gulf fish, and this fish special is a fine example with its fresh black drum served with peppery potato hash and sauteed asparagus. I had heard little about Eliza before first dining there. The restaurant opened late last year and seemed to have grown a following mostly by word of mouth. As we pulled into the shopping center where this under-the-radar restaurant is located, we noticed the storefront with its classic bistro awnings, lighting and café tables. Entering the airy space, we soon forgot we were in a strip mall. Shortly after we were seated, our friendly server asked if we were newbies. He then launched into the story of the husband-and-wife owners, highlighting their stints at Commander’s Palace. He expounded on the menu, noting that all fish is Louisiana-caught and brought in fresh daily. His enthusiasm for the restaurant and the food was contagious. 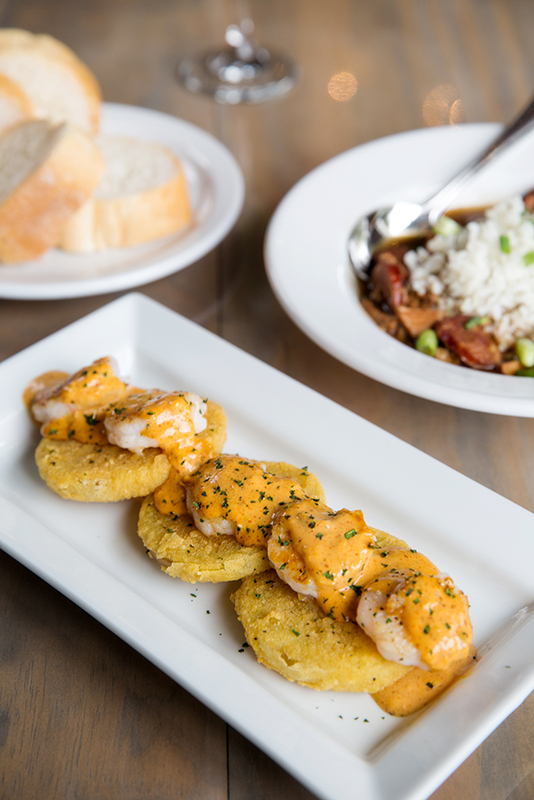 An appetizer must: Fried Green Tomatoes topped with Gulf shrimp and zingy housemade remoulade. We chose Fried Green Tomatoes with Gulf shrimp and housemade remoulade for an appetizer. The plump boiled shrimp were undeniably fresh, with great salinity. The tomatoes were thickly sliced and firm with a cornmeal crust that remained crisp despite a generous saucing. The sprightly and acidic remoulade tied all the components together well. Our second course, Gumbo Ya-Ya, had roasted chicken, andouille and popcorn rice. The gumbo was thinner than I prefer, but the huge pieces of roasted chicken along with slices of spicy sausage made up for the lack of heft. My partner said a darker roux would have been preferable to add depth and richness. Among the entrees, an assortment of South Louisiana favorites are offered, and while the table next to us raved about the Crab Cakes with Maque Choux, we couldn’t help being sucked in by the server’s description of the fish special. The offering was Mahi Mahi on a bed of potato hash seasoned with Worcestershire, peppers and spices. Sauteed Louisiana crawfish and beurre blanc crowned the filet. The potato hash blew me away first; I kept going back for more. The buttery sauce won me over next, with mild flavor and smoothness that was such a boon to the flaky fish. Jewels of sweet crawfish tails added the final flourish to a spectacular offering. 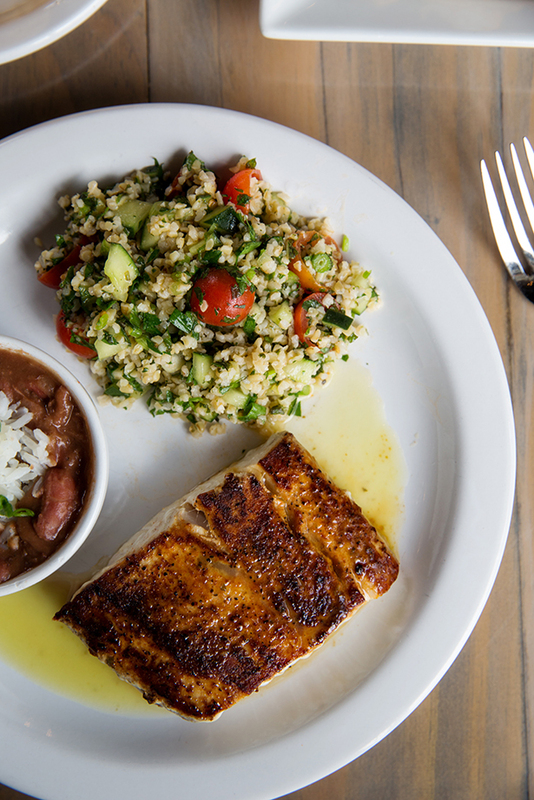 The Grilled Gulf Fish entree comes with your choice of sauce—herb-lemon vinaigrette in our case—and two sides. We picked the fresh and minty tabbouleh and sweet and creamy red beans and rice. We also tried the Grilled Gulf Fish, selecting black drum and the recommended herb-lemon vinaigrette. For the sides, I wanted the maque choux, but was I told they had just run out. So I pivoted to tabbouleh and red beans and rice, though I was fearful my eyes might be bigger than my stomach. The fish portion was quite generous, but luckily, the sides were a manageable size. My fish was incredibly fresh and perfectly grilled, and the vinaigrette was light with hints of lemon that enhanced without overpowering. The minty tabbouleh was a nice, cooling palate-cleanser with bright pops of juicy cherry tomatoes. The red beans were done up Creole style with a smooth, creamy texture and less overt spice than the Cajun variety. It was slightly sweet, and those who prefer this type of red beans will be delighted. Our server extolled the virtues of the Strawberry Shortcake, explaining that the housemade biscuits were what made the dessert. The sugar-topped fluffy biscuit lived up to the brag, but the dish we were served had a severe lack of berries. Past the second bite, it was mostly just biscuit and whipped cream. The server also encouraged us to try the Warm Chocolate Brownie a la mode. The moist and decadent brownie was obviously housemade, as was the sweet fudge sauce. Thank goodness there was an addition of simple vanilla ice cream to contrast all the delicious chocolate. Despite the high ceiling and hard surfaces, the noise level at Eliza was never a problem. If the restaurant could improve anything, it would be the hard wooden surfaces of the bench seating. Toward the end of our meal, it became uncomfortable. But the quaint setting, superb staff and great food helped diminish my lack of comfort and increase my desire to return. 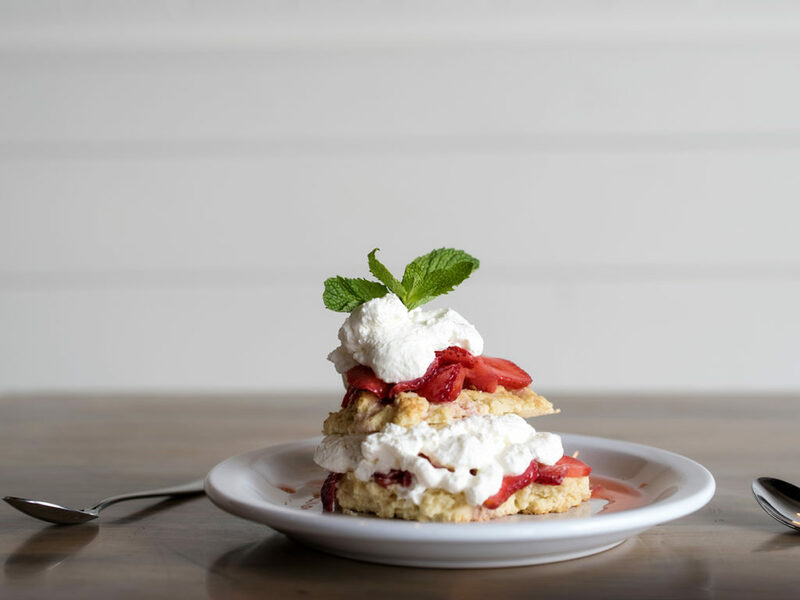 The Strawberry Shortcake dessert features housemade shortcake biscuits and layers of whipped cream and fresh strawberries. The basics: Russell and Sally Davis opened Eliza in a Jefferson Highway shopping center in late 2016. Focusing on contemporary Creole cuisine and a well-curated bar program, the small restaurant has grown from a neighborhood favorite to a citywide crowd-pleaser. What’s a must: The Fried Green Tomatoes appetizer, with plump Gulf shrimp and a tangy housemade remoulade; the Grilled Gulf Fish entree, with flaky fresh fish and a variety of sauces to choose from; and the Strawberry Shortcake dessert with crumbly housemade shortcake biscuits and layers of whipped cream.